Let’s now take a look at the earliest surviving documentation that makes mention of any of Aldbourne’s musicians. To do so we must view the churchwarden accounts that are now stored in Trowbridge, the two books can be seen in the archive department by anyone, anytime. The first entry that interests us was made 1807 and it shows that the church had embraced a musical group, or what it has since become known as the orchestra, and were providing it with instruments for the use in services. It is also interesting to note that the last of the village bell founders, James Bridgman, was a member of this orchestra and it would appear that he played a prominent roll in it. Several entries concerning him are to be seen, specially where the maintenance of the string bass was concerned, he must have played it. Although we don’t know the name of the leader of the group it may well have been him. Like his father John, James had worked in the bell foundry for the Wells family and had gone to London when the business had transferred there after the death of James Wells and then subsequent bankruptcy of the business in 1827. Not being happy to remain in London he returned a few years later and cast bells in his own name. His wife Elizabeth did much work encouraging education for village children, the 1841 census shows their address as being in “Baydon Street”. Bridgeman married in 1803 to Mary Brind d 1854 census of 1841 says her name is Elizabeth, how come? JAMES BRIDGEMAN 1782- d13 sept 1858 WORKING LIFE=1828-1851. We can see then that 1807 is the earliest mention of this orchestra but that sometime after 1823 it would appear it had gone. It had in fact been made outcast and ordered to be disbanded (more concerning this shortly) but we can probably presume however that this orchestra continued to get together after 1823 for the odd village function, we will probably never know as there are no surviving written records.known of that time. The next “known” group of musicians did not make an appearance for many years, thirty seven to be precise, but it possible that some of the next personel were past members of the first orchestra. The Aldbourne “amateur flute band” seems to have been very short lived as only three engagements were found concerning them. They performed in Ramsbury during June 1860 for the “Bell Inn Union society AGM” and shortly afterwards they played for the “Aldbourne Club” performing “their most popular airs”. Finally in the August of that year they accompanied a party of villagers up to Marridge Hill for a “tea party” where after games of cricket and other jollity’s they again played their “most popular airs”. The flute band is never again mentioned after 1860 and so we must presume that shortly after these final three engagements it discontinued. Within the pages of the churchwarden accounts for 1827 there is a record of an appeal to raise funds for the purchase of an organ, the appeal raised the sum of £82 -14 – 6d. Along side this list of subscribers is an amusing entry telling, in unduly large capital letters, that “TBM Baskerville, lord of this manor, promised to give five pounds towards the purchase of the organ and when called upon for the money forfeited his word and did not give anything”. The entry is signed by Richard Church and George Witts the churchwardens who were clearly very angry with Baskerville (who for some unknown reason renegaded on his promise) and were not afraid to tell the other villagers of their indignation. This list of donors and amounts given include an individual named Richard Brown Bunce who had given the sum of 2/6d. Here then is the first mention of the man I can definitely declare “Founded” the Aldbourne band. Richard Brown Bunce, baptised 6th of June 1808, was the sixth child born to John and Anne Bunce. Anne was a daughter of Mark and Elizabeth Brown and it would seem that she made certain Richard received a good education for although destined to become a humble village carpenter he did become a most respected villager and a very able musician. The Bunces farmed in Lottage road for over one hundred years and a barn that stood till recently on the site of the bungalow that stands to the right of the entrance to Lottage Way, was known as Bunces barn and was part of their farm complex and possibly Foundry cottage was their home. In 1859 he was living at 14 the Green, in fact an advert announcing that the property was to be auctioned told that he was the then occupier. It was described as having a walled garden, a pig sty and 30ft long carpenters shop where he practised his art of “carpentering”, the workshop was still standing in 1999. If the Bunce family did move they did not go far as the 1861 census shows that they were still living on the Green so it’s possible that Richard in fact bought the property. Richard may have worked along side his brother John, also a carpenter and wheelwright, and his business may have included his father John and Thomas his uncle as they were also both carpenters, a family trade obviously. We know that one set of his great grandparents were married at Chute and that his great uncle Thomas Bunce, a warrener, willed Richard’s father the tenancy of both the Aldbourne and Liddington Warren Farms. On January 18th 1832 Richard married Sarah Stephens of Ramsbury. She was three years older than him and incidentally their marriage took place in Aldbourne and not as you would expect in the brides home. Her death in 1843 left Richard to rear their six children alone but soon after, in 1845, he married Sarah Ann Turner of Liddiard Millicent. She provided him with a further seven children, though the two girls that were had both been named Ellen died in infancy. The names of his surviving children were George, Richard, Sarah, Rachel, Frances, Elizabeth, Marraine, Isabella, Emily. Charlotte and Alethea. Richard was heavily involved with church affairs as he was not only the church organist from 1842 to1860 but also sexton from 1836 to 1860. The warden accounts show annual payments for his work as organist, £6-00 in 1844 to £8-00 in 1854, I leave you to work out any rate of inflation. In 1861 he was paid £3-10-00 for attending the clock and chimes and as a village tradesman he was often asked to carry out remedial work on the church and many of the receipts he gave for payment still survive. A busy man then, he also found time to enumerate the 1841, 51 and 61 census`s. Richard, like his father, also attended to the fire engines, their upkeep was like many village affairs looked after by the Church, and an entry of 1838 shows a payment to Richard of £1-10-9d. In 1862 he was involved in extinguishing a large fire that had occurred at North Farm, then owned by Thomas Chandler and later he helped in the distribution of payment to those who had helped in its dousing, the disbursement was made by the Royale Exchange Insurance Company. He was also vice-chairman of the “Aldbourne Club”, one of several benefit societies that once existed. In 1860 a Mr Luke replaced Bunce as the church organist for Richard had been bestowed with the task of creating Aldbourne`s most celebrated entity for it was in the September of 1860 that Richard Brown Bunce formed the Aldbourne band, let me explain the events that brought this about. The summer of 1859 witnessed a panic that gripped the whole of our country. French armies, fresh from victories in Austria, were thought to be preparing for an invasion of Britain and so the ensuing consternation brought about a formation of literally hundreds of volunteer forces. By 1860 thousands of men had rushed to enrol into these “private” armies and so locally, throughout the later part of 1859 and the early months of 1860, local towns like Marlborough, Calne, Swindon, Wootton Bassett, and Devizes etc. had duly formed their own rifle corps, many “complete with bands”. The men of Aldbourne were not going to be left out of all this and a letter printed in the MT and dated Saturday, September 1st 1860, tells all. “The inhabitants of the secluded, though not less important village of Aldbourne, anxious not to be left behind the more populous towns in the county, in loyalty to their Queen and country have decided on joining with the surrounding villages for the purpose of forming a rifle corps and as an adjunct to the same have taken the necessary steps for the formation of a brass band, towards which, we are happy to hear some of the principle inhabitants have subscribed handsomely. The list is headed by the Rev G.P.Cleather, F.Neate, T.Chandler and others. The band will be under the tuition of Mr Richard Brown Bunce, by whom as bandmaster any subscriptions or contributions will be received”. This letter concluded with the mention the names of two members of Bunces band, they being J Palmer jnr, treasurer and J Smith, secretary. I must point out that all this must then mean that although the church had an orchestra the Aldbourne band did NOT originate directly as a continuance of it as had been previously believed. In 1827 that orchestra had been replaced by an organ and by 1860 many of the men who had been members would, even if still alive, I believe have been very unlikely to have taken any active interest in Bunce’s band. In 1860 Bunce also took over as agent for the MT meaning that he not only the vended the paper on Saturday evenings at five o’clock but fortunately for us also acted as the village newspaper correspondent as well and its very interesting to see how quick he was to promote not only his village but of more interest for us his band, note how he was not adverse to any self promotion as well. All was quiet for the next six months with no band reports until April 20 1861when a report told of the death of a young man. Bunce had replaced William Sheppard, a village baker and grocer as correspondent and it was his 24 year old son William who had died. William’s funeral was attended by many villagers and appears to have been a very sad affair. This report was of course written by Bunce himself and the following week an epistle was also printed. William Sheppard was the Aldbourne bands very first member, a detail I did not ever expect to discover. We move on to August 1861 for the first written report of the bands very first public engagement. Incidentally Mrs Mallet of the Crown did the catering and I believe the meadow was land that is now occupied by the tennis club in Castle st. The next engagement was for the Aldbourne Friendly Societies annual festival parade. The Aldbourne branch, formed in 1837, was titled as the Aldbourne Chase Court No 6336 and as such was for many years the most important of all the village welfare societies. Neate is a name of long association with our village, several being remembered on memorials in the church. AW Neate of Newbury owned land that he rented out but like many other persons little of Francis Neate is known. He is mentioned in the warden account books and in the years 1862 to 1866, it is written that both he and the Rev John Parker Cleather paid for the services of Bunce as organist. There were only two mentions of our rifle corps to be found so we must presume that this military force faded away as quickly as the threat of invasion did. Strangely three years were to pass before the next mention appeared when on the 9th April 1864 the band played at “Mr&Mrs Jerome Lionel`s entertainment”, Aldbourne band present under the able leadership of Mr Bunce, bandmaster”. Lionel, an American “now adjourning at Aldbourne”, was probably responsible for the earliest photograph as in 1861 he could be found advertising his business in Marlborough of “ambrotype” photography and athough its difficuly to confirm that the first plate this the photograph probably does date from this time. Tommy Liddiard stated in 1950 that “Fox Talbot himself” took a photo of the band, however I think that Tommy was being slightly enthusiastic with his comments and that Jerome was probably the one responsible. If you still think 1860 a very early date for a photograph the 1864 MT carries adverts placed by G.Jones, another photographic artist of Marlborough. 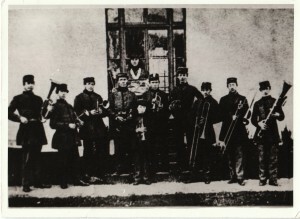 Sadly the whereabouts of the original photograph is unknown to us, it must be doubtful it still survives at all, but this copy was found in a collection of memorabilia that once belonged to Bob Barnes, a more recent bandmaster and I believe it to be of Richard Bunce’s 1861 rifle corps band in their new uniform. The instrumental line up is not easy to define but there appears to be the following: one baritone, five cornets, two clarinets, one bass drum, two trombones and an ophicleide. The chap third from the left appears to have a cornet tucked under his arm but is also holding a clarinet, note that two of the cornets appear to be of the helical type. If one of these men is Bunce then it must be the clarinet player to the left of centre as this character looks to be the only one old enough to be him. (I like to think it is Bunce anyhow). Sadly another early photo once existed and was lent out by its owner, John Fisher, but it was never returned and for us yet another slice of the bands history has disappeared? No reports in 1865 but 1866 saw them playing at a ploughing match at Lambourn Woodlands. Aldbourne’s Friendly Society parade was enlivened by “well known strains” and the next time they appeared in public seems to have been at a village tea meeting. “Mr Richard Brown Bunce attended with his band, which took of course a prominent part throughout the evening, and by their effident aid many a merry dance in which rich and poor alike adjoined, was brought to a happy termination”. There then followed another three year gap with again no mention of any band activities until 1869 when reports tell that they played at a ploughing match at Ramsbury, an Ancient Order of Foresters “Court Crowood” do complete with a procession and then next at Liddington`s Friendly Society event when “melodious strains did much to promote the enjoyment” of the day. Bunces band were also included in a private function given by Chandler of North farm when after a dinner party he had laid on for his farm workers, they led a procession from the “Crown Commercial Inn” up to the Green. Three barrels of beer, paid for by Chandler was distributed to the waiting two or three hundred or so farm labourers that had gathered there. Little relaxation was to be had and the word holiday was rarely used so no wonder so many men jumped at the chance for a bit of fun and a free glass of beer, One is left to ponder on just where did they get all those glasses from? The 1868 Friendly Society parade report recorded that ” the farm labourer has but few holidays and so looks foreward to club day”. Finally that year the band were involved in a village ploughing match when the 500 odd “visitors and onlookers” were escorted by the band out to fields in Lottage Road. For ten years Bunce led his band until the day he suffered a most terrible accident. It too is to be found documented in the MT and is described in some detail. There is a problem with where this accident actually happened but It would appear that of all the spots to choose to fall through a ceiling he had fell from above the stair well of the Old Rectory. Thomas Arthur Palmer told us this in a letter to our parish magazine, but in the report it states that it occurred in Mr Church’s house. Searching through the census lists we see that a Mr Church lived in West street and not in the Old Rectory but as no house in West street has anything like a 25ft ceiling, this accident could not have happened there. One theory is that the printer who was setting the type face and reading from a hand written letter miss read the word THE for MR. If this is correct the sentence would have read “the churches house” (i.e. the Rectory) and not “Mr Churches house”. This theory contains one little glitch and that is that the same report in the Swindon Advertiser quotes the very same wording and lets face it, the chances of the same mistake being made by two different printers are small to the extreme, so I can only presume that the only other answer is that the writer of the latter actually wrote it down wrong in the first place. As this my only concern of accuracy, does it really matter if we don’t know the truth? Well the course of history won’t change too much if we don`t and this event must join the other few that we may never know all about. Richard is buried with his first wife at the rear of the church under the wall of the Court House along side his parents and his headstone is very easily found. The impact of Bunce’s death was to be very disastrous indeed and for the band a most monumental calamity. Thomas Arthur Palmer, in his 1950’s letter stated that the band probably “collapsed” after Bunce’s death. A leader would certainly have been most necessary and his replacement was a very essential and urgent matter. The band was not able to replace Bunce and so and it would seem quite definite that it did cease. This demise is surely confirmed with the absence of any mention of the Aldbourne band in any MT reports for many years to come. Any musical events that did occur here during this absence were also rare. In 1870 the Ramsbury Choral Society performed in our National school room and in 1871 a Mr J Hollaway played “cornet solos at a tea given for the young hand bell ringers” at the Mason’s Arms. This Mr Holloway must have been a local bandsman, if not from Aldbourne (he is not to be found in any Aldbourne census list), from Bishopstone, Wanborough or somewhere equally close. The reason for his presence as a cornet player at this function is also unknown. In 1876 there was a return visit of the “Ramsbury Choral Society”. The report stated that “It`s a long time since this village has been able to boast of having anything in the shape of a concert in the National School Room”. Mention of any bands parading through our streets during this time are also thin on the ground but there are a few to be found. In 1883, 84 and 85, the Aldbourne benefit society used the services of the Wootton Rivers and Swindon Primitive Methodist bands. Although the Marlborough Times is the most incredible source of information and tells us so very much it sadly does not tell us everything. On this occasion nothing is to be found documented about any band demise and to conclude this moment the use of a little postulation is essential before we move on, lets just recap on what we know so far. The last mention of the Aldbourne band had last occurred in 1869, the year before Bunce died when it played for Ramsbury’s Ancient Order of Foresters and the Liddington Friendly society parade and it was not until 1885, some fifteen years later, that the band re-appeared proper playing in a political parade. Proper? an unexplainable one off appearance happened in 1882 when “the band” played in the friendly society parade. There are no more details on this event to be found anywhere and try as I might I have failed to find any written explanation of this apparent appearance and I feared it might have to remain a mystery forever but I think that I do have the answer but will explain later.